TWO observations sprang to mind when I heard about the closure of a family-run store in York Rise, Dartmouth Park, this week. The Georgiou’s family have been serving customers for over 50 years, but much to the disappointment of scores of loyal customers, George and his brother in law Chris have decided to call it day. George’s father came from Cyprus after the war and quickly settled locally. His family have watched generations grow up, and become an integral part of the community in Dartmouth Park. They introduced people to a Cypriot diet years before olive oil, hummus, pitta bread and feta cheese was trendy. This is a wonderful advert for a word that is all too often used by politicians with negative connotations: immigration. Observation number two: the Georgious for years have allowed families to have credit books, kept neatly behind the counter. As customers gathered to say farewell, there were many who expressed the thought they could not have done without the Georgious help in lean times. One single mum said that when times were hard, she was so grateful the Georgiou’s trusted her to take a bag of groceries away and bring the money in when she could afford it. This is the sort of trust is all too rare in an age of the characterless supermarket. 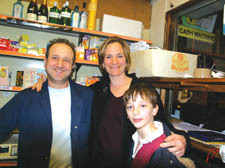 Georgiou’s shop was a reminder of a gentler time of the village store. Their decision to retire is an end of an era. Regulars are throwing a party for the family at the Dartmouth Arms pub tomorrow (Friday) evening. AFTER we had exposed Town Hall workmen for pocketing the goods of tenants thrown into skips, politicians and officials promised to put a stop to this scandal. But is it, in some form or other, still going on? Yesterday (Wednesday) the story emerged of a “void clearance” at a council flat in Balmore Street, Highgate, that had been conducted without any inventory being taken and with no valuation of the goods removed. A witness to the clearance claimed to have seen pictures, furniture and cutlery being separated from the less valuable contents during the course of a three day removal. This suggests that all is still not well in the world of skip removals – and it happened only 10 days ago! A council press official explained that it had not been necessary to carry out an inventory or to value the goods because the former tenant had left voluntarily and signed a warrant to allow the council’s team to clear the flat. And the goods had all gone into a skip... just as those belonging to 92-year-old Dorothy Robinson were cleared from her Gospel Oak home while she lay in a nursing home with days to live. That little scandal, exposed by this newspaper, triggered an investigation by the council. Back then, six months ago, the council said her possessions had no value and had been disposed of in a skip because she had no next of kin. Not only did our investigation find antiques from her flat on sale nearby, but it also uncovered eight living relatives. Meanwhile, New Labour have sensibly called for an independent inquiry into the whole affair. This may be partly motivated by a play of party politics, for they must sense the embarrassment among the Tory ranks at the outspokenness of some of their back benchers over the skip scandal – one appeared in a damning account of the story on ITV news slot the other day (See Page 2). Rebel councillors have been accused of ‘headline hunting‘ by their colleagues. I WARMED to Pat Breen straight away when he came to me in the 1970s for his first interview for a job as a reporter. Like me, he had left school at 18 – he from a tough school in neglected Somers Town, Sir William Collins, now smartened up as South Camden Community School, me from a commercial college where I learned Pitman’s shorthand and touch typing to martial tunes played on a gramophone, and also fell in love with literature and history. He had clearly decided, like me, to make life his university. Aside from school, he was mad about the Air Training Corps, another plus, in my book, from someone who had done his National Service. He was oddly self-composed for his age, as if he had had to bear responsibilities beyond the normal experiences of a teenager. Thus, he had a bearing quite beyond his years. Also, to my surprise, he carried a copy of the Daily Telegraph when he walked into my office, as a kind of challenge. For that he intrigued me all the more. He turned out to be a natural reporter with the kind of insatiable curiosity a good journalist must have. Though he appeared to espouse Conservative views in his first year at the Journal, he proved a loyal colleague when a dispute arose over the closure of the old Camden Journal, leading to picket lines, fund-raising and the publication of a maverick weekly eight page paper called Save the Camden Journal, produced by the striking journalists and sold in the streets. He had a mischievous sense of humour. Once, returning by car with colleagues from a picket outside a printers in Wales, he opened a window and startled pedestrians by shouting Save the Camden Journal! I wasn’t surprised to learn that after the dispute he soon became established in journalism, rising to executive positions. But he never forgot his roots. And in the last 15 years or so he became a tenants’ leaders in Somers Town, where he had grown up on a council estate. He died fairly young but left behind affectionate memories shared by hundreds of people: witness the crowded funeral service yesterday (Wednesday) at St Aloysius Church in Somers Town, attended by well over 200 people, including councillors and tenants’ representatives. His family must have felt immense pride that he had influenced so many people in such a short span of time. I HEAR the barrister representing the Heath and Hampstead Society in their High Court battle to stop a new house being built in the Vale of Health was unable to attend an appeal hearing this week because of a nasty illness. QC David Altaras, who lives in Hampstead, accepted a brief for the society some time ago, but at a hearing on Tuesday at the High Court, the society said he had to stand down: The court was told Mr Altaras had been taken ill while on holiday in the Swiss Alps. Doctors originally thought it was pneumonia but his condition worsened and he was rushed back to Britain, where I hear he is making a slow recovery from what his doctors apparently say is a mystery virus. Got a problem here, I thought. Maybe I’m sitting next to an alcoholic? We got talking, and she explained that she lived alone as a widow, her husband having died several years ago. Her daughter thought she shouldn’t drink so much sherry. “But what harm can it do?”, she protested. To remember her husband, she said, she went every week for Mass at a local church, and felt good about that. Clearly a Catholic, we talked about other local churches such as Our Lady of Hal in Arlington Road, Camden Town, which she had attended. But her own church off Marylebone High Street, was her choice. “Are you a Catholic?” she suddenly shot at me. I told her I wasn’t, that, in fact, I was an athiest. “I do like being a Catholic.”? I didn’t quite know what she meant by that, but I left things as they were.